Hanging Off Jefferson's NoseA reader wrote to ask me about Hanging from Jefferson's Nose: Growing Up On Mount Rushmore, a new picture book about the father and son who carved Mount Rushmore. Lincoln Borglum's father, Gutzon Borglum started carving what we know today as Mount Rushmore, and when he died, Lincoln finished the project. Hanging from Jefferson's Nose is by Tina Nichols Coury. Here's an excerpt from her website:In character as “The Rushmore Kid” she [Coury] visits schools across the United States to present her popular "Why I Love America” program, which promotes an understanding and appreciation of the essential qualities that make America great.I understand and appreciate love of one's nation, but we ought to be critical of the things about America that are not great, too. Blind allegiance is dangerous. The mistakes made by its leaders, for example, must be something that children learn, and there are plenty of mistakes made with regard to the ownership of the Black Hills and Mount Rushmore. That land was taken without the consent of the Lakota people. The U.S. government has tried to settle with them by offering them money, but, that land is sacred to the Lakota's, and they were not, and are not interested in the money. They want the land. Here's the text for the page:Winters were harsh in the Black Hills. For the Lakota Indians who lived there, food was scarce. The Borglum family helped out often and went so far as to arrange for a buffalo herd to be donated to the tribe. At the powwow to celebrate, the grateful Indians made Lincoln and his dad blood brothers of the Oglala Lakota Tribe at the Pine Ridge Reservation. Lincoln was happy to lend a hand but dog-tired after dancing all night.Notice that it's all about how the great white man helped the poor Indians. Even if the incident happened, it's misleading in this context. It may be relevant to a Borglum biography, but it's not relevant to the taking of Mt. Rushmore. What were the political and economic pressures on the Lakota to give up their land? How did they respond to these pressures? Overall, what were their feelings about the Mt. Rushmore project. The book apparently doesn't answer these obvious questions. Here's what the Wikipedia entry for Mt. 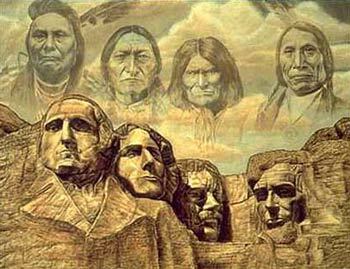 Rushmore says about the same period:South Dakota historian Doane Robinson is credited with conceiving the idea of carving the likenesses of famous people into the Black Hills region of South Dakota in order to promote tourism in the region. Robinson's initial idea was to sculpt the Needles; however, Gutzon Borglum rejected the Needles site due to the poor quality of the granite and strong opposition from environmentalists and Native American groups. As Six Grandfathers, the mountain was part of the route that Lakota leader Black Elk took in a spiritual journey that culminated at Harney Peak. Following a series of military campaigns from 1876 to 1877, the United States asserted control over the area, a claim that is still disputed on the basis of the 1868 Treaty of Fort Laramie (see section "Controversy" below).Instead of this sobering information, the book gives us happy talk about grateful Indians. The implied corollary practically writes itself. 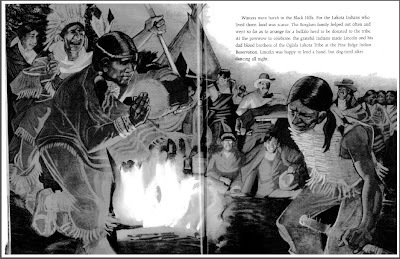 "The Indians were so glad to be fed that they gave up their land willingly. It was a small price to pay for the white man's generosity." As Reese observes, the all-night dance around a campfire is straight out of an old Western movie. She's never seen or heard of a genuine dance like this and neither have I. It looks like pure stereotyping: Indians as savages who express themselves with primitive actions rather than sophisticated words. In short, Hanging from Jefferson's Nose is another in a long series of failed children's books. For more on Indians in children's literature, see Indian in Worse than Rotten, Ralph and Playing Indian in Not Me!